Jean, an ex-movie star who left Hollywood some time ago, lives with Yvonne, her daughter. 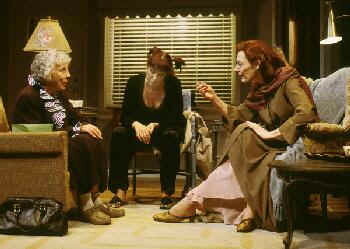 Their main activities together involve reenacting moments from Jean’s old movies, in which she always seemed to play the “other woman.” After placing an ad seeking more information about Jean, Selma is invited into their lives. Selma is obsessed with Jean — not with the real one, but with the one on screen — to the point that she hopes to learn how to become Jean. When not submerged in Jean’s past, Selma works with Brother Harmon, also a fan of Jean, running a shelter for “the hopeless.” While Jean seeks hope and faith, and Selma seeks Jean, and Harmon seeks love, Yvonne simply wants to be left alone. 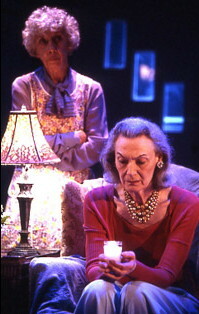 By the end of the play, Selma takes over Yvonne’s responsibilities as caregiver for Jean; and Harmon, with his sincerity, sweeps Yvonne off her feet. Ben Brantley, “The Sleepless Nights of a B-Movie Temptress,” New York Times, July 11, 2002. Don Shewey, “3 Women, Take 2,” Greekworks.com, July 2002.